world. Muzio offers us the tools to become that change." 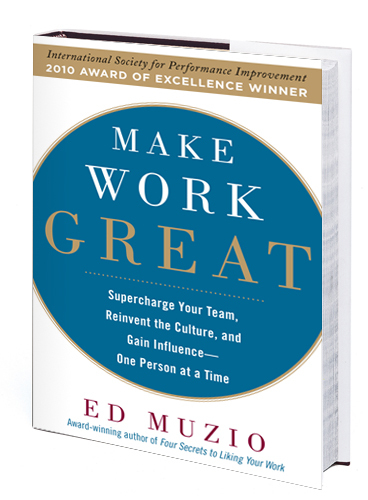 Make Work Great (McGraw-Hill, June 2010) by Ed Muzio offers managers and executives at every level a blueprint for building a positive, motivating, and productive workplace in any kind of organization. Top-down hierarchies are becoming outmoded, especially in today’s decentralized, multi-cultural business environment. Ed gives managers the tools to fundamentally alter the culture and inspire workers to support, collaborate and pool their talents. Ed presents easy-to-implement, non-disruptive daily activities that strengthen peer relationships in any group, and make any organization stronger, more resilient, and better able to respond to challenges. For more about Ed's work, visit The Group Harmonics Home Page.